Activated charcoal has a long history of medical uses. The first recorded therapeutic uses of activated charcoal were by the ancient Egyptians over three thousand years ago. It was for wound healing. The substance itself has an expansive surface area and is adsorbent, which means it has a unique ability to bind with toxins and wash them away. Over time, this quality has caused activated charcoal to be found safe and effective for poison control, cholesterol management, flatulence and a number of other medical conditions. How activated charcoal makes toothpaste better. whitens – activated charcoal is mildly abrasive and has a vast surface area. This helps it cling to the film on your teeth’s surface so your toothbrush can remove surface stains and unsightly plaque. de–toxifies – bad breath is commonly caused by bacteria feeding on decomposing food particles left in the mouth after eating. Activated charcoal’s vast surface area and its qualities of adsorption work to gather up and rinse away the bacteria, leaving you with a clean-feeling mouth that lasts. The toothpaste is black because the natural color of activated charcoal is black. Be assured that the color is quick to disappear in your mouth and to clean-up easily. Dental professionals will tell you there is a risk of over-abrasivity when you use products designed for extra whitening. And that harsh abrasives can cause lasting damage to your tooth enamel. It is for this reason that The American Dental Association places an upper limit of 250 on a test it uses to measure abrasivity. The measure is known as RDA (Relative Dentin Abrasivity). The Natural Dentist Charcoal Whitening Toothpaste’s average RDA is 76, placing it well within the range of the most popular everyday toothpastes. What makes this charcoal toothpaste so special? The Natural Dentist Charcoal Whitening Toothpaste uses activated charcoal that has been purified, activated and ground into a fine powder. The toothpaste base uses selectively sourced gentle ingredients chosen specifically for their proven therapeutic benefits. Healing Aloe vera tops that list. Also, the product contains no harsh ingredients that can irritate your mouth. That means no artificial sweeteners, flavors or dyes and, most particularly, no sodium lauryl sulfate (SLS). Finally, its unique Cocomint™ flavor is a pleasant-tasting combination of coconut and mint. 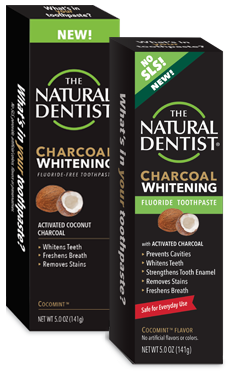 The Natural Dentist Charcoal Whitening Toothpaste is available in Fluoride (coming soon!) and Fluoride-free formulations. For ingredients and directions, click here. The best charcoal toothpaste ever! First time ever trying any brand of Charcoal base toothpaste. I have to say the taste and texture is perfect. I use this toothpaste daily. It has my mouth feeling fresh and teeth more whiter than ever. I received a sample to try and now that I have finished them I am a convert to The Natural Dentist products. I have tried other charcoal kinds of toothpaste before but have found them too abrasive and filled with unnecessary ingredients. The texture is smooth and the formula does not cause any irritation. I really like the unique coconut charcoal and the cocomint flavor. Throughout my time using the toothpaste I found that my teeth were whiter and maintained a whiter appearance. It helps to remove surface stains effortlessly. I was sent a sample to try and I was very happy with the results. My mouth felt very clean and fresh. I liked the minty taste. It was long lasting. I bought this last week and I'm already loving it. It's done so much for my sensitivity and I can't wait to try everything else of yours. I received a sample of the Charcoal Whitening Toothpaste from a Facebook contest. I was really surprised to see the difference in the look of my teeth after using it. My teeth were white and felt clean. I feel like the taste is a little sweet, but otherwise I am very happy with this toothpaste. Loved this new charcoal toothpaste. Surprised by the great-tasting cocomint flavor. This new toothpaste has made brushing fun for my children! I was fortunate to receive a nice size sample of this toothpaste, and have been using it for about 2 weeks now. I have used charcoal powder in the past, but this charcoal toothpaste is much easier to use. It cleans well and has a nice, fresh taste. My whole mouth feels very clean after brushing. I have sensitive teeth and it doesn't set off pain either. "Regular" toothpaste tastes soapy to me and has lots of chemicals in it that I don't want. The Natural Dentist has far better and more natural ingredients. This is terrific product and I would definitely recommend it. I really like this toothpaste. It works well, is definitely already whitening my teeth, and makes my mouth feel much cleaner. I was able to try a sample of this product and was delighted with it! It has excellent flavor for whole mouth freshness, actually DOES whiten the teeth, has good lather and easy distribution throughout the mouth. So pleased. Want to use this one forever! Received toothpast a few weeks ago. Was not sure what to expect, black toothpaste! Love it. My teeth are brighter. It taste good!. I will continue to use.it. love it!!! I was very skeptical at first with it bein a black toothpaste but surprisingly it works as stated and even tasted good left my breath smelling good. "The Natural Dentist Activated Charcoal Flouride Free Toothpaste from The Natural Dentist has a very nice natural mint flavor. It uses activated charcoal sourced from coconut husks to whiten, brighten, and freshen breath. I am a huge tea drinker. I have tried every whitening toothpaste, strips, trays, pens and more. None of them had the results I am getting now. My teeth feel extremely clean and smooth. In less than two weeks they are exceptionally whiter. This toothpaste does not contain SLS, artificial ingredients, flavors, dyes, sweetness, or artificial preservatives. Instead it contains soothing and healing botanical ingredients like aloe vera, echinacea, coconut oil calendula, and goldenseal. It is #vegan and not tested on animals. The black color of the toothpaste comes from the highly effective activated charcoal. I am extremely happy with this toothpaste. We have to brush twice a day so why not use a good for you toothpaste that actually delivers results. Honestly I did not think I would be raving about toothpaste. After trying so many different options to whiten I did not have high expectations. This definitely exceeded them. 5 star rating." Got samples a little over 2 weeks ago and although it leaves a refreshing taste in mouth, I do not see any whitening of teeth. Might still by product because it leaves a refreshing taste and fresh mouth smell. This toothpaste worked really well. It did not have have a bad taste or aftertaste. It was minty and left my teeth feeling clean and mouth feeling fresh. I felt my teeth clean throughout the day. I did notice a lot of plaque build up overnight. I would have to say that I really appreciate how gentle and mild this toothpaste is. It does a great job of cleaning the teeth and has a good mint flavor. It isn't overpowering. I like the fact that it takes care of a lot of the staining as well.